There is a very tiny town near here (Carver, MN) that most of the storefronts have been turned into what we call occasional shops. They are open only one long weekend a month, Thursday through Sunday, and they all are open on the same weekend. 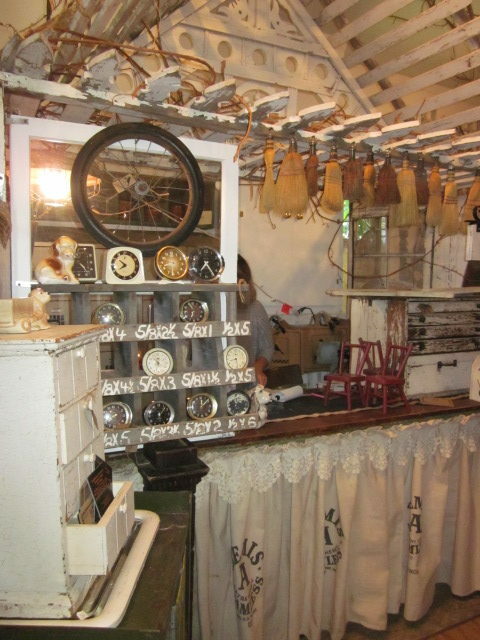 So for a short period of time each month, the town is flooded with customers looking for a deal on antiques, architectural artifacts and collectibles. It is kind of a festive, fun outing and I always find something I “need”, right? See those little red chairs on the counter, ready for me to take home. I was very excited to find three at one time. Here they are at home with me. 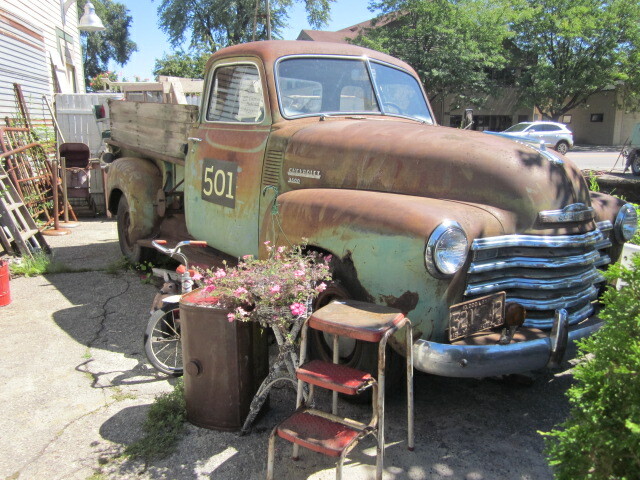 I have always loved old trucks. Definitely a nod to my father. Isn’t the color great on this one? My husband has always been fearful that one of these shows up in our driveway. 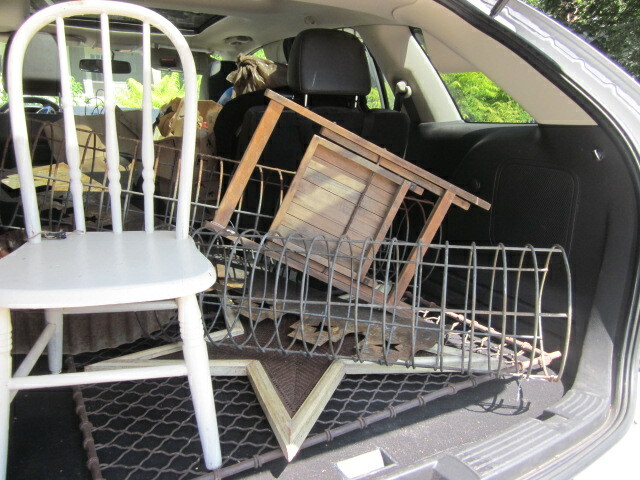 Check out the back of my car. It always tells me when I must stop. I have found a spot for everything I found that day. 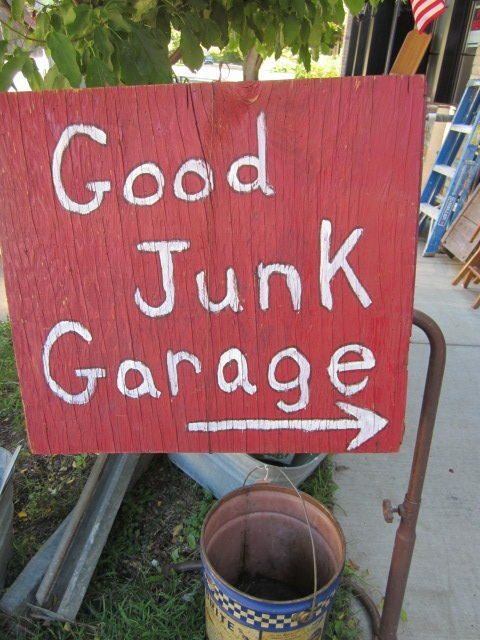 I need to always remind myself that If I don’t use it, it is just junk in my garage and actually not a fun find or accessory. The chair is in the playroom in our basement. The star is hanging in our cabin. 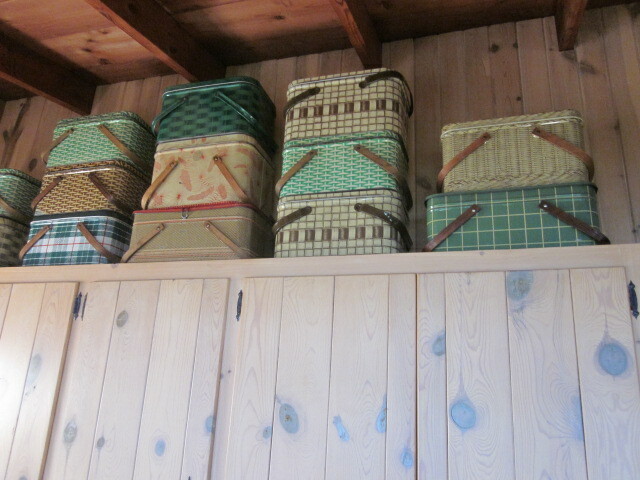 A tin picnic basket was added to my collection above the pine cupboards at the cabin. The kitchen has a vaulted ceiling so there is plenty of room to add colorful tins. 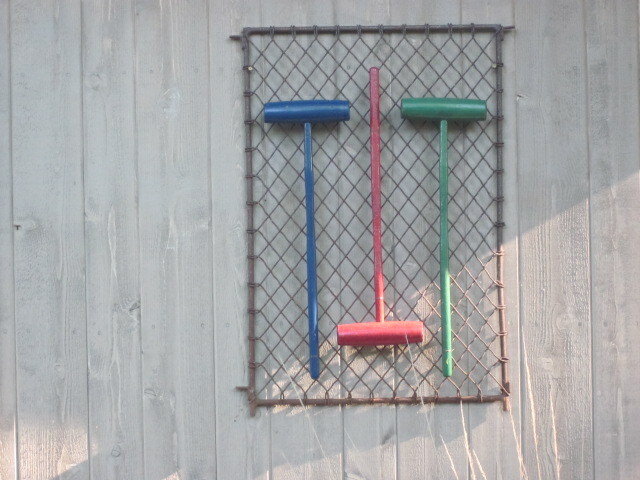 The circular metal pieces of two different sizes are in my garden nestled among bushes and Hosta and the metal grate on the floor of the car has become a backdrop for old croquet mallets that I have painted and wired on it for an outdoor art pieces on the back of our utility shed at the cabin. It is the first thing you see when you turn into the driveway. 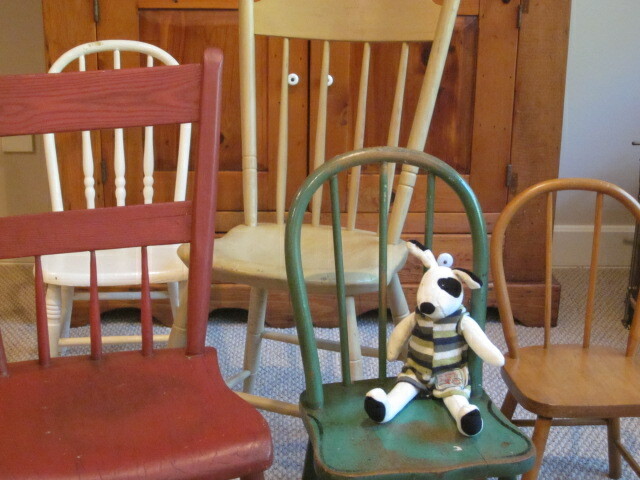 Other little chairs that I have collected are about the house and at our cabin. I can’t resist them, obviously. I at least now only buy ones that do not need fixing and are sturdy enough to actually use. 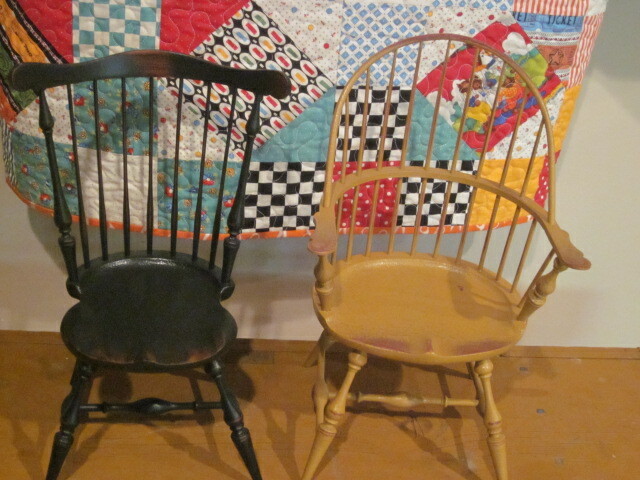 The two painted chairs in front of a hanging quilt are also doll size. They are new, but I have always loved them. They have been used in every room of my house at some point in the past twenty years. These little chairs below are not full size but yet a little too tall for a kids table. 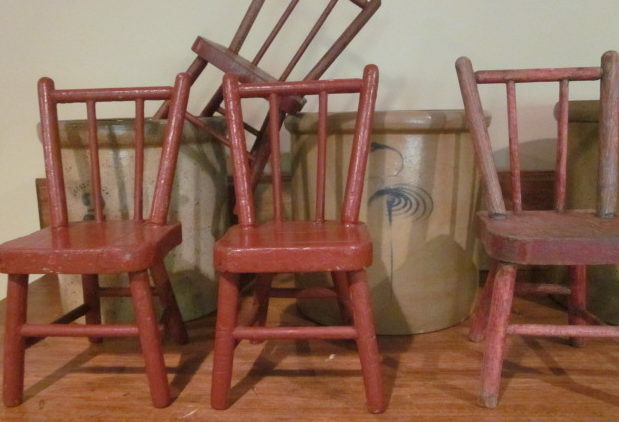 They were perhaps chairs from a country school house a very long time ago. My dad found these for me years ago and I like how short and stout they are. They have a very “mission oak” style about them. They have really flat slab seats and are very uncomfortable. Nobody lingered or lounged in these chairs! I use them as shelving for quilts. 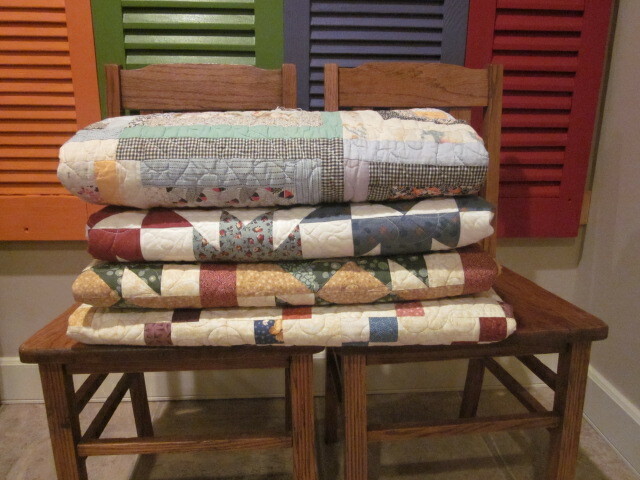 There are never enough surfaces to display quilts. It also makes them pretty handy to grab and use for anyone. You now how I feel about showing color, pattern, prints and all the hand work and care that goes into a quilt. The quilt on the top of the stack is over 100 years old. It was a quilt top I got from a neighbor. I had it quilted with a very light batting and a flannel backing. It is everyone’s first choice around here including my grandson, so it is now housed in his room. Hi Lynette, I love all your post let me say that first. I especially enjoyed this one because I love everything you bought. I admire the fact that you found a home for everything right away. I sometimes buy old things because I just have to have it. 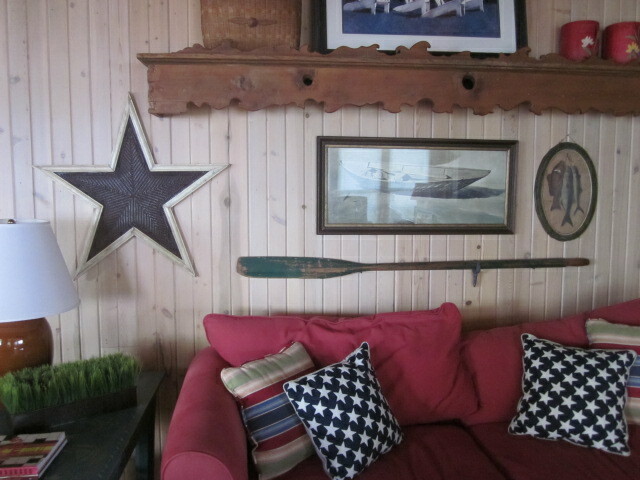 In fact I have a few of those things right now sitting in my basement from a trip to Cape Cod two summers ago! I am a decorative painter and they are things I bought to paint on, maybe this summer I will find the time….. I love chairs too! You were so lucky that you got to those three red chairs before someone else did. What a great find!! I own a chair just like that white one you bought, it’s also very comfortable. Now, you mention your cabin….I’m not familiar with it and I am curious about it. I’d be interested in hearing any thing you might like to share with me about this cabin. I have to confess that even though I am a quilter, I have bought many of your books because of the lovely photos of your home in them. I enjoy looking at every photo, inside and out. You have so many tins! I wish I had just a handful of what you own. I just love them all. Sorry for talking your ear off, I could write more but I’ll give you a rest!! I may not comment on every post you write but I read ever single one and enjoy every word you write. Thanks Lynette for sharing with us. You asked about our cabin….Minnesota is known as the Land of 10,000 Lakes and having a cabin on a fresh water lake is quite common. The one we have is on a small, clean, spring fed lake that was first owned by my parents. They first owned the property with my aunt and uncle and they built it themselves. I spent every weekend and many summer weekdays there my entire life. As it turns out, my husband also grew up on the same lake. We met in high school and had the whole lake experience in common. His family’s cabin was across the lake from ours. Many of the cabins here from that era are cabins…cottages, not homes and are closed up during the winter. So when summer hits…we are all out at the cabin. It was a big part of my life. My best friend as a child and now too, probably was my cousin who was there every moment I was, swimming, waterskiing, inner tubing, fishing and all those things kids do at a lake. As a teen, all of my friends were welcomed there by my parents and it became the place to hang out. Neil and I took it over when my parents wanted to bow out of owning the property. So my children spent their summers there as well and it too became the hang out for their friends. And now, my daughter’s family have a cabin next door so our grandchildren are on the same path. They were even playing with old inner tubes that my dad brought out to the cabin over 50 years ago. The property has so many fond memories. Both of my parents have passed, but I feel the strongest connection to them when I am there. A lot of pictures of the cabin were featured in the book, The New Collection of Classic Quilts. It is still in print and available from Landauer Corporation. Thank you for your kind note. It is always fun to hear from “kindred spirits”. I really enjoyed these decorating ideas! The metal picnic basket display is wonderful. The colorful croquet mallets are eye catching! The little chairs are adorable! Of course, I love to see your quilt displays. Thanks for sharing your treasures! Enjoy your postings…You are a girl after my own heart. The little chairs are adorable! I love all your finds and what you did with each one. I try to not go antiquing anymore. I already have way more than I need!